http://democracynow.org – Pulitzer Prize-winning journalist Glenn Greenwald responds to reports that the Trump administration has prepared an arrest warrant for WikiLeaks founder Julian Assange. Attorney General Jeff Sessions confirmed the report at a news conference Thursday. Last week, CIA chief Mike Pompeo blasted WikiLeaks as a “hostile intelligence service,” in a stark reversal from his previous praise for the group. AMY GOODMAN: CNN is reporting the Trump administration has prepared an arrest warrant for WikiLeaks founder Julian Assange. Attorney General Jeff Sessions confirmed the report at a news conference on Thursday. REPORTER: Can you talk about whether it’s a priority for your department to arrest Assange, once and for all, and whether you think you can take him down? ATTORNEY GENERAL JEFF SESSIONS: We are going to step up our effort and already are stepping up our efforts on all leaks. This is a matter that’s gone beyond anything I’m aware of. We have professionals that have been in the security business of the United States for many years that are shocked by the number of leaks. And some of them are quite serious. So, yes, it is a priority. AMY GOODMAN: Last week, CIA chief Mike Pompeo blasted WikiLeaks as a, quote, “hostile intelligence service,” in a stark reversal from his previous praise for the group. Pompeo made the remarks last week at the Center for Strategic and International Studies in his first public address as CIA director. MIKE POMPEO: It’s time to call out WikiLeaks for what it really is: a nonstate, hostile intelligence service often abetted by state actors like Russia. … In reality, they champion nothing but their own celebrity. Their currency is clickbait, their moral compass nonexistent. Their mission, personal self-aggrandizement through destruction of Western values. AMY GOODMAN: In his speech, Pompeo went on to accuse WikiLeaks of instructing Army whistleblower Chelsea Manning to steal information. He also likened Julian Assange to a “demon” and suggested Assange is not protected under the First Amendment. It’s been nearly five years since Julian Assange entered the Ecuadorean Embassy in London seeking political asylum, fearing a Swedish arrest warrant could lead to his extradition to the United States. Glenn, welcome back to Democracy Now! Your response to this latest news that the U.S. government, that the Justice Department, is preparing an arrest warrant for Julian Assange? GLENN GREENWALD: What’s interesting is, the Justice Department under President Obama experimented with this idea for a long time. They impaneled a grand jury to criminally investigate WikiLeaks and Assange. They wanted to prosecute them for publishing the trove of documents back in 2011 relating to the Iraq and Afghanistan wars, as well as the U.S. State Department diplomatic cables. And what they found, the Obama Justice Department found, was that it is impossible to prosecute WikiLeaks for publishing secret documents, without also prosecuting media organizations that regularly do the same thing. The New York Times, The Guardian, many other news organizations also published huge troves of the documents provided by Chelsea Manning. So it was too much of a threat to press freedom, even for the Obama administration, to try and create a theory under which WikiLeaks could be prosecuted. Fast-forward five years later, there’s been a lot more WikiLeaks leaks and publications, including some really recent ones of sensitive CIA documents, as well as having spent all of last year publishing documents about the Democratic National Committee, which means they’ve made enemies not just of the right in America, but also the Democratic Party. And the Trump administration obviously believes that they can now safely, politically, prosecute WikiLeaks. And the danger, of course, is that this is an administration that has already said, the President himself has said, the U.S. media is the enemy of the American people. And this is a prosecution that would enable them not only to prosecute and imprison Julian Assange, but a whole variety of other journalists and media outlets that also routinely publish classified information from the U.S. government. AMY GOODMAN: So let’s go back to what CIA chief Mike Pompeo said in his first address as CIA director. MIKE POMPEO: The days like today, where we call out those who grant a platform to these leakers and so-called transparency activists. We know the danger that Assange and his not-so-merry band of brothers pose to democracies around the world. Ignorance or misplaced idealism is no longer an acceptable excuse for lionizing these demons. AMY GOODMAN: And CIA chief Mike Pompeo continued. MIKE POMPEO: Julian Assange and his kind are not the slightest bit interested in improving civil liberties or enhancing personal freedom. They have pretended America’s First Amendment freedoms shield them from justice. They may have believed that, but they’re wrong. Assange is a narcissist who has created nothing of value. He relies on the dirty work of others to make himself famous. He’s a fraud, a coward hiding behind a screen. AMY GOODMAN: Julian Assange responded to the comments earlier this week while speaking with Jeremy Scahill on the Intercepted podcast. JULIAN ASSANGE: Pompeo said explicitly that he was going to redefine the legal parameters of the First Amendment to define publishers like WikiLeaks in such a manner that the First Amendment would not apply to them. What the hell is going on? This is the head of the largest intelligence service in the world, the intelligence service of the United States. He doesn’t get to make proclamations on interpretation of the law. That’s a responsibility for the courts, it’s a responsibility for Congress, and perhaps it’s a responsibility for the attorney general. It’s way out of line to usurp the roles of those entities that are formally engaged in defining the interpretations of the First Amendment. For any—frankly, any other group to pronounce themselves, but for the head of the CIA to pronounce what the boundaries are of reporting and not reporting is a very disturbing precedent. This is not how the First Amendment works. It’s just—it’s just legally wrong. The First Amendment is not a positive definition of rights. It’s a negative definition. It limits what the federal government does. It doesn’t say the federal government must give individuals rights and enforce that. It limits what the federal government can do to take away a certain climate of open debate in the United States. So, the First Amendment prevents Congress and the executive from engaging in actions themselves which would limit not only the ability of people to speak and to publish freely, but would also limit the ability of people to read and understand information, because it is that climate of public debate which creates a check on a centralized governmental structure from becoming authoritarian. It’s a right, from that perspective, for all the people, not just the publisher. AMY GOODMAN: So that’s Julian Assange speaking on the Intercepted podcast. 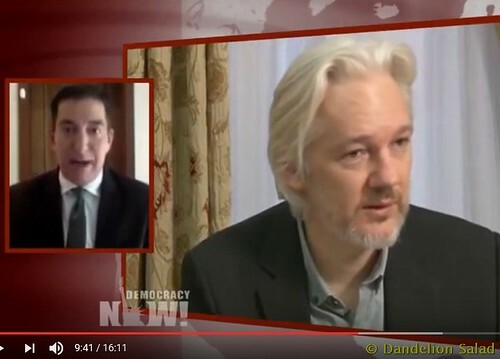 Glenn Greenwald, if you can respond to both—both Julian as well as the CIA director, Pompeo, and what he’s alleging? GLENN GREENWALD: I think the key point here to understand is the way in which governments typically try and abridge core freedoms, because what they know is that if they target a group that is popular or a particular idea that people agree with, there will be an uprising against the attempt to abridge freedom. So what they always do, for example, when governments try and abridge freedom of speech, is they pick somebody who they know is hated in society or who expresses an idea that most people find repellent, and they try and abridge freedom of speech in that case, so that most people will let their hatred for the person being targeted override the principle involved, and they will sanction or at least acquiesce to the attack on freedom because they hate the person being attacked. But what happens is, the abridgment then gets institutionalized and entrenched. And that way, when the government goes to start to apply this abridgment to other people that you like more, it’s too late, because you’ve acquiesced in the first instance. And that’s why groups like the ACLU, when they want to defend civil liberties, are often—so often defending the most marginalized and hated groups, like neo-Nazis or white supremacists or the KKK, because that’s where the attacks happen. This is what Mike Pompeo is strategizing to do now and what Jeff Sessions wants to do, as well, is they know WikiLeaks is hated on all sides of the political spectrum. The right has long hated WikiLeaks because of all the publications they did of Bush-era war crimes, and Democrats now despise WikiLeaks, probably more than anybody else that they hate, because of the role that Democrats believe WikiLeaks played in helping to defeat Hillary Clinton. And so, what Jeff Sessions is hoping, and probably with a good amount of validity, is that Democrats, who should be the resistance to these sorts of attacks, will actually cheer for the Trump administration while they prosecute WikiLeaks, because they hate WikiLeaks so much, and that U.S. media outlets, which also hate WikiLeaks, won’t raise much of a fuss. And that way, this very dangerous precedent of allowing the CIA and the Trump Justice Department to decide who is and who is not a journalist, what types of journalism are protected by the First Amendment and what types aren’t, will be entrenched as precedent. And that way, the next time there’s a leak that they hate in The New York Times or by NBC News, they will have this theory, that everybody signed on to, that said that the First Amendment doesn’t apply to certain people if you publish documents that are sensitive enough, or if you work enough with certain sources before the publication, that you’re deemed a collaborator. That’s what makes this moment so dangerous for core press freedoms. AMY GOODMAN: Let me get your response to this other point that CIA chief Mike Pompeo made. MIKE POMPEO: In January of this year, our Intelligence Committee determined that Russian military intelligence, the GRU, had used WikiLeaks to release data of U.S. victims that the GRU had obtained through cyber-operations against the Democratic National Committee. GLENN GREENWALD: Well, first of all, there’s been no evidence, of course, presented by the U.S. government that that’s actually true. They’ve stated that over and over, but there’s been no evidence presented of it so far. But let’s assume for the sake of argument that they’re actually telling the truth, that the Trump CIA director is being honest and that that’s really what happened. What does that mean in terms of WikiLeaks? Nobody suggests that WikiLeaks did the actual hacking. In this case, even if what they’re saying is true, it would mean that WikiLeaks received information from a source—in this case, a foreign government—and then published that information that every U.S. media outlet in the country deemed newsworthy, because they constantly reported on it. This is a very common practice, where U.S. media outlets receive information from sources, often foreign sources, including officials within foreign governments, and then publish or report on the information that they’ve been provided. If you allow that process to be criminalized simply because WikiLeaks’ source in this particular case happened to be a foreign government or a foreign intelligence agency, you are, again, endangering press freedoms in a very substantial way, because that is something that media outlets do very often. That’s where they get their information from. AMY GOODMAN: And let’s turn to CIA Director Mike Pompeo talking about your news organization, that you co-founded, Glenn, The Intercept. GLENN GREENWALD: So that was an article written by one of our reporters assessing WikiLeaks’s journalism. We criticize the journalism of pretty much every media outlet. We’ve certainly written far more scathing critiques of The New York Times and NBC News and The Washington Post when they’ve published fake stories or when they’ve done misleading and deceitful journalism. So the fact that we’ve been critical of some of WikiLeaks’s journalism, just as WikiLeaks has sometimes been critical of ours, doesn’t justify turning them into felons and prosecuting them. If bad journalism or making poor journalistic choices can now justify having the Justice Department prosecute you, there will be no media organizations left. So, he was trolling there by citing one of our articles that was mildly critical of WikiLeaks’s journalism, but that obviously does not remotely justify prosecuting WikiLeaks for having published secret documents. AMY GOODMAN: So, what happens right now? There is Julian Assange inside the Ecuadorean Embassy for almost five years now. What does it mean that there is an arrest warrant from him by the United States—for him? GLENN GREENWALD: Well, that’s—that’s a really significant question, Amy. And when Mike Pompeo made his speech, the one that you’ve been playing, it was very deliberately threatening. He was saying things like “We are no longer going to allow them the space to publish this information. This ends now.” And the question that you just raised is the towering one for me, which is, OK, so the U.S. government indicts WikiLeaks and issues an arrest warrant for Julian Assange. It doesn’t change the fact that he’s currently in the Ecuadorean Embassy, where he has received asylum. And remember, the reason the Ecuadorean government gave Julian Assange asylum in the first place was because they said they were worried that if he were extradited to Sweden, that that would then be used to send him to the United States, where he would be prosecuted for publishing information, for doing journalism. That was always what Ecuador was most worried about. So it seems very unlikely that Ecuador is going to voluntarily withdraw its asylum. So then the question becomes: Do they have any plans to physically seize Julian by invading the Ecuadorean Embassy, something the U.K. government actually thought about doing early on? Do they—are they trying to do a deal with the new Ecuadorean government to provide them benefits, or threaten them, in exchange for handing Julian over and withdrawing the asylum? Or is this just theater? Is this just show? Is this just a way of the Trump administration showing that they’re trying to crack down on leaks? I don’t think we know the answer to that question. But the asylum that Julian has should prevent the U.S. government from apprehending him, even if they do decide to go ahead and indict WikiLeaks. AMY GOODMAN: Chelsea Manning is about to be released in May. The argument that he’s making that Julian Assange solicited Manning, the information, your final comment, Glenn? AMY GOODMAN: We’re going to leave it there, but, of course, we’re going to continue to follow this. Glenn, thanks so much for joining us. AMY GOODMAN: Glenn Greenwald, Pulitzer Prize-winning journalist, one of the founding editors of The Intercept. Officials reportedly claim the Department of Justice is ready to file arrest charges against WikiLeaks founder Julian Assange. Press advocates warn that if the US goes after the pro-transparency publisher, they could go after other news outlets as well. This entry was posted in All Posts News Politics and-or Videos, CIA, Imperialism, Media and tagged Chelsea Manning, Donald Trump, First Amendment, Glenn Greenwald, Iraq War Documents from WikiLeaks, Julian Assange, Mike Pompeo, Russiagate and/or Russophobia, Same As It Ever Was, Vault 7 CIA Leaks, WikiLeaks. Bookmark the permalink. This obscene caricature CIA ‘Head’ is a mouthy bucket of disgusting toxic slush, stapled precariously to a super-sized fake mannequin. What a creep.